Modesty In Vogue: Three dimensions of the word "hijab"
Three dimensions of the word "hijab"
"The concept of the word hijab is three-dimensional, and the three dimensions often blend into one another. The first dimention is a visual one: to hide something from sight. The root of the verb hajaba means 'to hide'. The second dimension is spatial" to separate, to mark a border, to establish a threshold. And finally, the third dimension is ethical: it belongs to the realm of the forbidden. So we have not just tangible categories that exist in the reality of the senses-the visual, the spatial-but also an abstract reality in the realm of ideas. 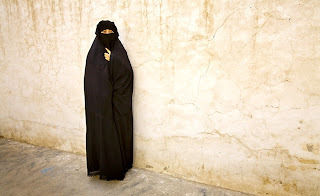 A space hidden by a hijab is a forbidden space."